How would you characterize “The Great Gatsby”? He was…uh…great! It’s August 1st. It’s tax-free weekend here in Missouri. 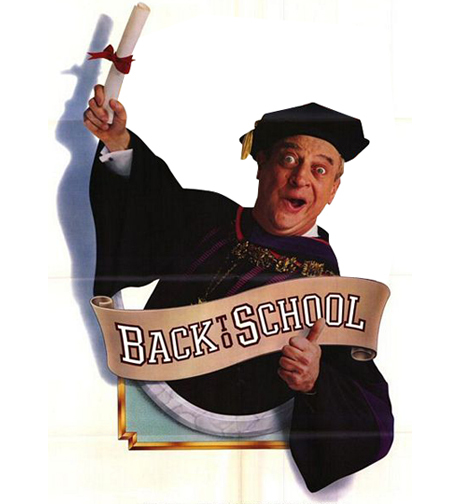 And that means… It’s Back to School time. And today I officially become a college student again too. I have not been in a physical classroom since the Spring of 2000, and I won’t be in a physical classroom this time either. I’m getting my BS in Business Management through an only program with WGU Missouri. I’ve been preparing for this day since late May when I first looked at the WGU’s website and requested information. I set August 1st as my official start date for sentimental reasons, and to give myself two months to decide if I was ready to do this. It also gave me time to secure a student loan to cover my first two semesters, which are actually 6 month terms with WGU. I’ll discuss more about the whole WGU experience in another post. So, what made me want to go back to school? In the middle of May, I attended my nephew’s high school graduation. He graduated from the same high school I had attended and graduated from in ’94. My favorite teacher (English and Drama) was there and I approached her at the end of the ceremony to say hello. Sadly, she did not remember who I was. She recognized my voice, but couldn’t remember my name. This hurt my pride a bit, as I had been in her classroom three of the four years of high school and I was best friends with her daughter and in band with both of her children at one time. But yeah, do the math, that was twenty years ago and I haven’t seen her since. I had to give her a break. She was retiring this year; it was still nice to talk to her nonetheless. When I returned home, I got to thinking about how I regretted not becoming a teacher. I romanticized the idea of the difference I could have made in students’ lives. I could have been someone’s favorite teacher attending their nephew’s graduation years later. Even though it wasn’t that long ago, it’s amazing how much things have changed just since then. That night, I saw a commercial on TV for WGU, and a few days later I was researching an education program on their website. Yep, I was considering becoming a teacher finally. I signed up for the elementary education program and was all set to take that next step until I learned you had to be prepared to do a 20 week student teaching capstone UNPAID at the end of your program. For me, that would have been in about two years and I would have to quit my current job to do it. If I had enough money in savings to cover living expenses for at least a year, I would have done it in a heartbeat. But then reality set in. So many people become teachers these days. It’s a dream job. We want to make a difference. We want to become that favorite teacher I spoke of. But, it’s not really like that. As we know, education is the first to get cut. The odds of getting a job are 10 to 1 or worse. Teachers get laid off and can’t find work. And, I discovered I make just as much now as a first year teacher would, and in some cases I’m making more! And I really wouldn’t be worth squat without going back to school and getting my Masters. Yep, reality set in and it set in hard. Had I become a teacher fifteen years ago, I think it would have been much different. Obviously, the politics of it would be. But I would have had a different mentality about being a teacher too. By now, I’d have tenure, I’d have my masters, and I’d be set in my ways. If I was teaching high school, by now I’d be teaching the kids of my first graduating class. And then I got to thinking about the social ramifications of it all. No kid ever killed themselves when they got bullied back when I was in school. I was that kid who got bullied. And no kid brought a gun to school. We had no metal detectors at the entrance. Like I said before, it wasn’t all that long ago, but things were different back then. So, I quickly changed my major. That’s makes me laugh because I wasn’t even “officially” back in school and here I was changing majors already. Ha! Just like the old days. But, I decided to approach a degree in which I already had experience, something I was good at. The truth was I’d been in business since I was sixteen. I had been in management since I was twenty. And for the last nine years, I’ve been in wholesale. And since last October, I’ve been a senior account rep. It seemed obvious to me that, now at 37 years of age, I needed to stick with what I know. So, I chose Business Management. It’s something that I think will benefit me and my current employer more in the long run. I’m amazed and fascinated just at the technology of WGU’s online and enrollment process. Every week since I’ve signed up, a counselor or mentor has called my house to talk to me and check in. Back when I went to a real campus, they just cashed the check and I showed up. No one ever called to check on me. Heck, no one really cared if you actually showed up either. And WGU’s online student portal is like a Facebook all on its own. It’s so organized and easy to use. There are even online student communities where you can connect with others. And, I don’t have to go somewhere and takes tests if I don’t want to. WGU provides a webcam which I’ll use to take my exams right at my desk and all online. And all of the classes are based on competency, what you already know, not how much time you spend in a classroom. So, I can excel and move forward at my own pace and take more classes each term if I want. Right now, I’m signed up to take 3 classes (12 credits) for my first semester, but if I finish and still have time, I can add another class and another, working at my own pace. Back when I attended the University of Memphis from 1995 to 2000, you couldn’t even register for classes online. They had just started experimenting with you being able to do it via phone. And my last semester, they were working on being able to do it online, but you had to still go to the campus and use a computer in a lab to do it. There was no student email back then, and when they finally did assign you an email address, the interface to use it was so complicated that I never did. Let’s go ahead and say it…no Facebook back then, no Twitter, no tablet, no iPod, no SmartPhone, no cell phones either. I actually went to class and wrote papers and took notes on paper. And look at me now, thirteen years later doing the college experience all over again, taking classes and getting a degree, and doing it all online and in a computer in the home office. Wow! I have to admit I was hesitant at first, but so far it’s been a great experience and I haven’t even started my first official class yet. Wow…look at me. A college student all over again. It’s back to school time and I feel like going out and buying some brand new Vision Elite Bic Uni-Ball Black Ink Pens just to celebrate. Maybe a pack of No. 2 pencils and a Mead 3 Subject Notebook? I know what you are thinking…what’s an ink pen? Good for you, Shannon. By the way, back when I first started at University of Memphis (Memphis State University, back then), we had to go in person and stand in LONG lines to “pull a card.” So, for English Lit I stood in one long line and if I was lucky, the person at the table would still have a “card” for me when I got up there. Then again for every other subject. It was horrible. There was always at least one class that had no more “cards” after you’d waiting in line for an hour. So, back to reworking your schedule, finding another class that would fit into the slot you had left, and standing in another line.